Barbie outfit 1980 #1369 Beginners Fashions, perfect. Barbie outfit 1981 Peaches N Cream doll, with belt and brush. 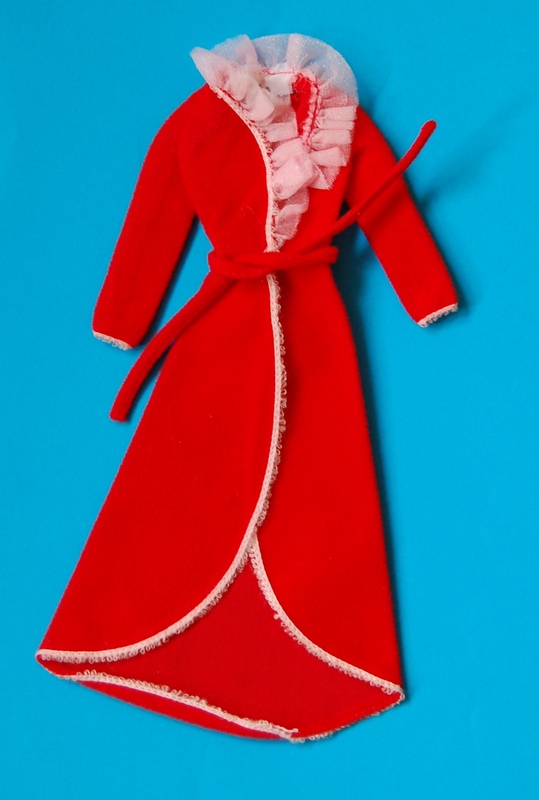 Barbie outfit 1981 #3640, bath robe with htf cap. Barbie outfit 1981 #3686 Fashion Collectibles. Barbie outfit 1981 #3792 Fashion Favorites, yellow rain coat. Barbie outfit 1981 Magic Curl doll. Barbie outfit 1982 #4828 Twice as Nice, excellent. Barbie outfit 1982 #5613 My First PJ. Barbie outfit 1982 #5654 Designer Collection Date Night. Barbie outfit 1982 #5743 Wedding of the Year. Barbie outfit 1981 doll Pink n Pretty, with hair accessories and shoes, like new condition. Barbie outfit 1983 #2120 My First Barbie Easy On Fashion, ballet outfit. Barbie outfit 1983 #2188 Dream Glow, some play wear. Barbie outfit 1983 #4811 Fashion Fantasy. Barbie outfit 1983 #4813 Fashion Fantasy. Barbie 1983 #4821 Twice as Nice, perfect. Barbie outfit 1983 #4822 Twice as Nice. Barbie outfit 1983 #4826 Twice as Nice, no playwear. Barbie outfit 1983 #4828 Twice as Nice, with shoes, excellent condition. Barbie outfit 1983 #4869 My First, like new condition, with htf slippers. Barbie outfit 1983 #7081 Designer collection, with small spot, needs to be cleaned. Barbie outfit 1983 Ballerina Superstar doll (because of stand needs shipped with parcel mail). Barbie outfit 1983 Fabulous Fur outfit, excellent. Barbie outfit 1983 Fashion Play doll, excellent. Barbie outfit 1983 Fashion Play, European Exclusive, with htf red belt. Barbie outfit 1983 My First doll. Barbie outfit 1983 Safari doll, European exclusive. Barbie outfit 1983 Superstar Bride doll European Exclusive. Barbie outfit 1983 Tropical Miko doll. Barbie outfit 1984 #2090 Fashion Fun. Barbie outfit 1984 #4868 My First, new condition. Barbie outfit 1984 #7909 Fashion Fun, as new. Barbie outfit 1984 #7910 B Active Fashions, one decal missing, excellent, htf. Barbie outfit 1984 #7911 B Active Fashions, as new condition. Barbie 1984 #7916, complete, excellent. Barbie outfit 1984 #7917 Fashion Fun. Barbie outfit 1984 #7951 Twice as Nice. Barbie outfit 1984 #9084 TV News Reporter. 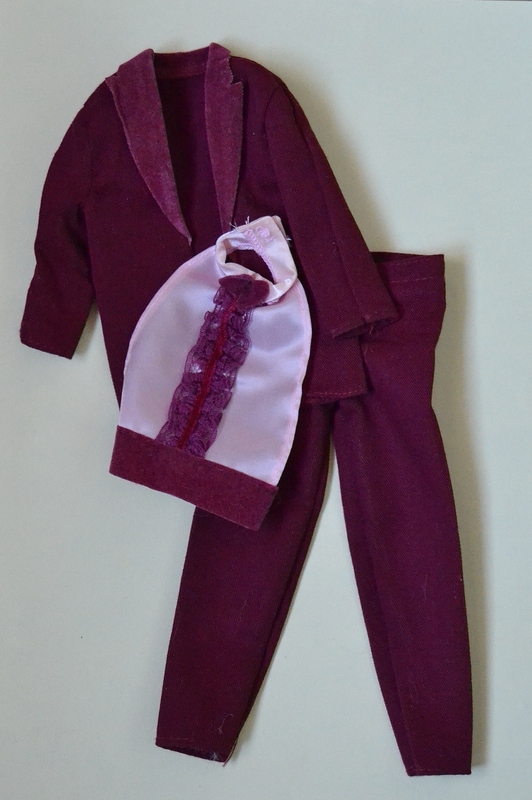 Barbie outfit 1984 #9143 Spectacular Fashions, minor playwear, all pieces present, htf. Barbie outfit 1984 #9144 Spectacular Fashions, with wear., mainly on the dress. Barbie outfit 1984 #9144 Spectacular Fashions, with some playwear. Barbie outfit 1984 #9145 Spectacular Fashions, complete and unplayed with. Barbie outift 1984 #9261 Oscar de la Renta, excellent condition, couple of loose threads on the gold. Barbie outfit 1984 #7903 Fashion Fun. Barbie outift 1984 #7904 Fashion Fun, with htf belt. Barbie outfit 1984 Beauty Secrets doll, minor playwear. Barbie outfit 1984 Day to Night, very minor playwear (not new), complete with scarf, purse, suitcase, calculator, papers, two pairs of shoes. Very nice set. Barbie outfit 1984 Lovin’ you Superstar doll, excellent. Barbie outfit 1984 Water Sports Fashion Playset. Barbie outfit 1985 #2181 B Active, excellent. Barbie outfit 1985 #2184 B Active, pink dress., excellent. Barbie outfit 1985 #2192 Dream Glow. Barbie outfit 1985 #3102 Romantic Wedding. Barbie outfit 1985 #7921 Easy on Fashions, with shoes. Barbie outfit 1985 Rock Stars Dee Dee black leather skirt, excellent. Barbie outfit 1985 Ken outfit Rockers fashions #2691. Barbie outfit 1985 #1176 Rock Stars Rockers , excellent. Barbie outfit 1985 Rock Stars Diva doll, complete. Barbie outfit 1985 Rock Stars fashions #2688, very minor playwear. Barbie outfit 1985 Rockers fashions #1166. Barbie outfit 1985 Rockers fashions #1167. Barbie outfit 1985 Rockers fashions #2690, complete, htf. Barbie outfit 1986 #3181 Francy Frills lingerie, excellent. Barbie outfit 1986 #3248 Haute Couture, perfect. Barbie outfit 1986 #3390,Rock Stars Fashions vhtf, excellent. Barbie outfits 1986 Rockstars Concert Tour Fashions #3391 and #2689, from play lot, htf. Barbie outfit 1987 #4484 Sweater Soft. Barbie outfit 1987 #4891 Sensations Fashions. Barbie outfit 1987 #4487 Sweater Soft, perfect condition. Barbie outfit 1987 Fashion Play doll, European Exclusive, perfect, htf. Barbie outfit 1987 Jewel Secrets Princess Laura outfit, hardly any playwear. Barbie outfit 1987 Jewel Secrets Princess Laura outfit, some playwear. Barbie outfit 1988 #1304 Dinner Date. Barbie outfit 1988 #1527 Weekend. Ken outfit 1980 #1948, complete. Ken outfit 1980 Disco doll. Ken outfit 1982 #5744 Wedding of the Year Tux, in new condition, except for minor storage spot on rever (see pic). Ken outfit 1984 #4885 Ship-Shape, Twice as Nice. Ken outfit 1984 #4887 Double Vested, Twice as Nice, complete, excellent. Ken outfit 1984 #4890 Smashing Duo, wouldn't call it tlc, but certainly wrinkled from storage, needs some work htf. Ken outfit 1984 #5824 Date with Barbie Fashions Classics. Ken outfit 1985 #2309 Twice as Nice, perfect, complete. Ken outfit 1985 #3104 Romantic Wedding, excellent. Ken outfit 1985 #9117 Twice as Nice, from play lot, minor play wear. htf, no shoes. Ken Rock Stars, parts of the original outfit and accessories..